On Friday at 3:00pm I headed back from Shoreline to Seattle. I had scheduled a 4:00pm meeting with my friend Genessa in Columbia City and a 5:00pm meeting with my friend Molly in Mount Baker. I'm never late, and often have to force myself not to be early. At 3:45pm I had only gotten about 40 blocks on Aurora so I called Genessa and told her there was no way that I'd get to her by 4:00pm. She called me and we did some of our meeting on the phone. Genessa was completely empathetic to my situation. She told me how she'd been in gridlock two days before and had almost called the Seattle non-emergency police number to get out of it. By this point, I had gotten off in Fremont to try and circumnavigate the traffic. After about 45 minutes of almost getting killed by doing illegal sprints across different intersections, I realized that the Fremont Bridge was also not an option. I headed towards the University Bridge. I realized after 20 minutes that I'd never get over it so I turned back towards Fremont where I found myself hitting another wall of despair. I turned around again and headed down Northlake thinking, if I could just get to the Montlake Bridge, I could make my way to Lake Washington and finally get back to the south end. An aerial view of my car would have looked like a PacMan guy spazzing out. 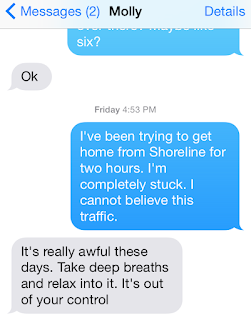 I was completely clear at this point that I was not going to get to Molly's house in South Seattle by 5:00pm. Molly is a Seattle native. She's also got a really solid head on her shoulders and is one of the best people I know to help process and/or put out fires. I texted Molly that I'd never get there in time (for those of you wondering about all this texting in the car, I use voice texting). Molly's response, "Take deep breaths and relax into it" was the last communication I had with anyone until I finally pulled into my driveway at 6:00pm. 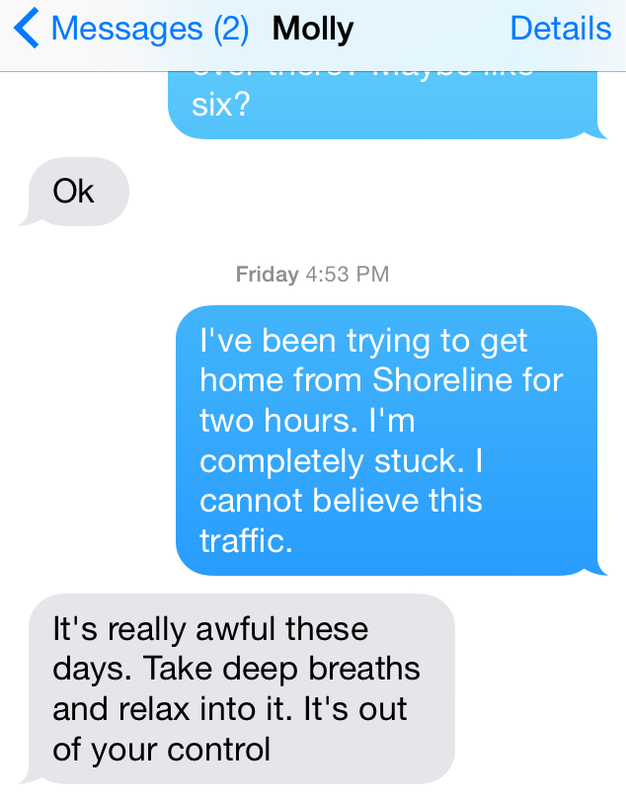 After getting Molly's text, I spent another 40 minutes trying to get to the Montlake Bridge, but once I got over, it was relatively smooth sailing. The traffic was bad that day. Really bad, and I had no control. Nobody had any control. Yet somehow I thought that I alone could figure it out. I knew, after trying nine different routes, that crossing the Ship Canal was going to be a long journey on that Friday afternoon, but I couldn't accept it. I had things to do, places to be. I couldn't let go of that, so I couldn't let go of the traffic. In not letting go, my anxiety was building. I had to pee. I was hungry. My schedule was being jacked. I was lost in it and unable to break out of my mental chaos. Enter Molly. Molly's words were just what I needed to get out of my mental spider web. Sometimes, even when we know a truth, it takes an outside reminder to jog it into our consciousness. Thanks Molly. I'm grateful for friends like you who help me put out the fires.